Suicides by gun accounted for about six of every 10 firearm deaths in 2010 and just over half of all suicides, according to data from the Centers for Disease Control and Prevention. Since the CDC began publishing data in 1981, gun suicides have outnumbered gun homicides. But as gun homicides have declined sharply in recent years, suicides have become a greater share of all firearm deaths: the 61% share in 2010 was the highest on record. 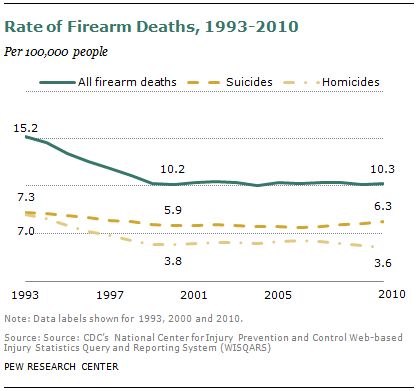 That year there were 19,392 suicides by firearm compared to 11,078 homicides by gun (35% of all firearm deaths). The rest were accidents, police shootings and unknown causes. In terms of both raw numbers and population rates, gun suicides have been on the rise in recent years, even as gun homicides have fallen. In 2010, the gun suicide rate was 6.3 per 100,000 people, compared with 3.6 per 100,000 for gun homicides.